We'd love to hear from you, and assist you in getting a flower portrait done for yourself or someone you know. 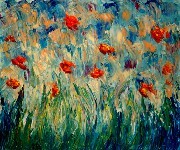 To capture your essence in flowers, the artist, Robert Blehert, need only talk with you, whether by phone or in person. If the painting is for someone the artist can't talk with, he need only talk with you about them. To purchase your flower portrait, simply send us 1/2 down (see prices below). The artist will contact you at that point - please allow 2 weeks to have your artwork completed. We'll send you an image of it by e-mail, and with your approval, you then pay the last 1/2 due and the artist will ship the painting to you. 1. PayPal - you don't have to be a member of PayPal to use their credit card services. They accept VISA, M.C., DiscoverCard and AmericanExpress. See the PayPal shopping cart below. 2. You can pay by check or money order. Simply e-mail us at: flowersofyou@gmail.com and we'll send you the information about payment. Washington residents include 9.5% sales tax.